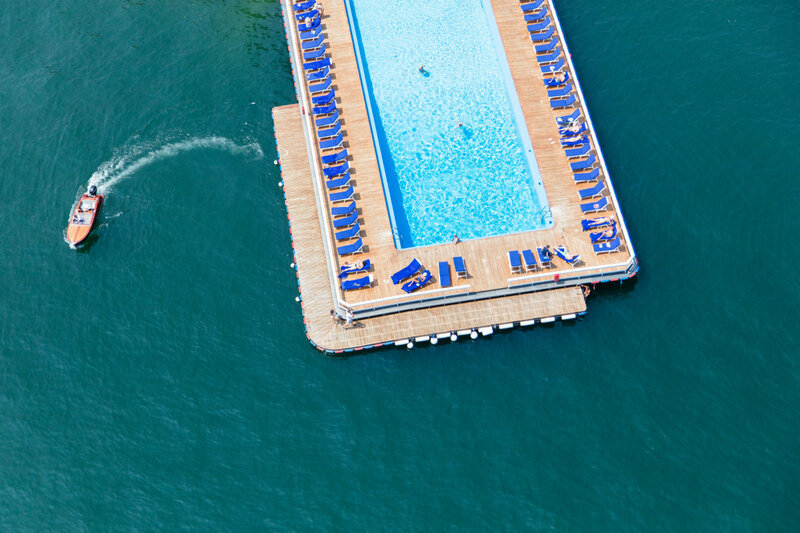 The fine art photography of Gray Malin bursts with color and whimsy. 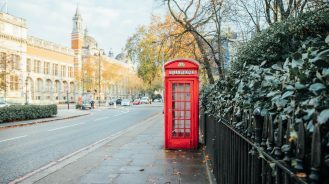 Traveling the world to capture the beauty of iconic destinations, be it remote isles or urban jungles, his images are the next best thing to being there. Stepping out from behind the lens, the Dallas-born photographer discuss his upcoming book on Italy, his wild project with the Parker Palm Springs and a few of his favorite places. Q What were some of your earliest creative influences when you were young? So many people, but some of my constants are my family and friends. My grandfather had a beautiful collection of cameras and his photographic hobby definitely influenced my father who always has a camera in tow. I can’t remember exactly, but I was definitely a youngster the first time I ever took my first photograph. Q How did you get into photography? I discovered the dark room in high school. It was a totally addicting experience watching my images slowly come to life in the developing trays. Around the same time, I discovered André Kertész. He was the first photographer whose work really moved me. I went to an exhibition of his in Paris a few years later and I remember thinking I just had to be a professional photographer one day. Q You interned with some well-known photographers before going out on your own. What did you learn doing that? Right around the same time that I began extended photography education, I also interned for big photographers like David LaChapelle. Combined, these two experiences gave me the confidence to take out a booth at a Sunday swap-meet in West Hollywood. Though it was a humbling experience, I met so many incredible people in the community and was able to display my work effectively, eventually making a name for myself. I really don’t think I can choose just one, so instead I’ll select three along with their corresponding series: Bora Bora for Art of Living, Cape Town, South Africa for À la Plage, and Italy for La Dolce Vita. Q Speaking of Italy, what spots do you love there? It is fair to say that I wholeheartedly love Italy. 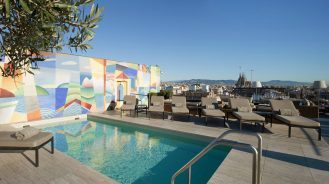 I am inspired by so much of it, from its stunning coastline to the bustling cities, and of course, its rich culture and influence in all things La Dolce Vita. The Amalfi Coast stole my heart the first time I visited years ago and has beckoned me back many times since. During my most recent trip this past summer, I had the chance to spend time in Tuscany, which made me fall in love all over, again as the rolling hills and delicious wines mesmerized me. Then, there is, of course, Lake Como, Venice, Sicily, Rome, Florence… truly there is so much to love about Italy. In fact, my third coffee table book is completely devoted to this captivating country. Gray Malin: Italy, which is currently available for pre-sale, will be officially released on May 14th. I’ll be doing a big book tour in support of it, so I hope to see some of you reading along there! Q Of all of the aerials you’ve shot of famous beaches, which beach is the best to lounge on? Wow, this is such a hard question. 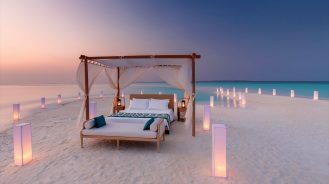 I would have to say either St. Barths or Harbour Island, Bahamas when it comes to truly lounging. Q What makes an interior photo-worthy? A room becomes photo-worthy when the interior design is thoughtful, it should tell a story of the person who decorated it. And, of course, it should have attention grabbing artwork. Q What tips do you have for those looking to make their own vacation pics more artistic? I’m a big advocate for personality. For example, I like to take a picture of my hand holding a glass of champagne or perhaps a morning espresso with a beautiful setting in the background. Q Tell us about the shoot you did with animals at Parker Palm Springs. I love creating juxtaposition in my photographs whenever possible. 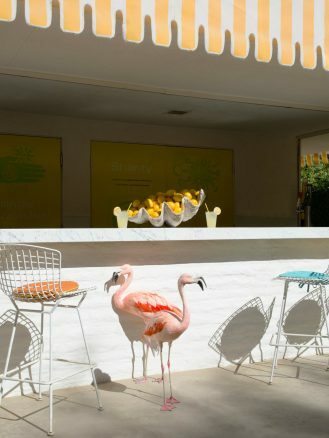 My series, Gray Malin at the Parker, does just that as it’s a collection of photographs of wild animals playfully enjoying the grounds of this iconic hotel. The grounds are beautiful and just give ample breath to one’s imagination. This collection grew into three separate installments, as well as inspired my first children’s book, Be Our Guest! Q What’s your fave type of vacation to take? I love a vacation that is a combination of both exploration and complete relaxation. I need time to decompress and simply lounge on a beach or at a hotel’s dream spa such the Aman Tokyo, where I went for our Daddy Moon. Then, once I’ve had enough downtime, I want to explore what the destination is all about. From taking in all of the sights to eating at the must-try restaurants, I want to get the full experience of the destination I’m in. Business class or better when it comes to air travel is definitely an indulgence for me. However, it’s something that I’ve come to accept is well worth the extra cost, or often using airline travel points and upgrades. Arriving to your destination after an uncomfortable flight is never a nice way to start off a trip. There really are so many places I still aspire to explore, but I’d say my current top picks are Morocco and New Zealand. Ps. 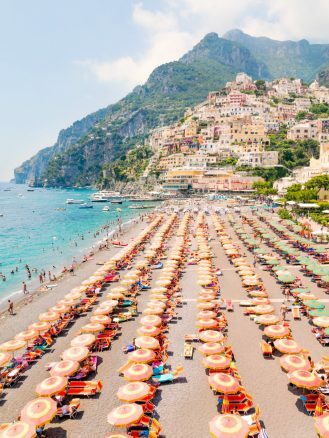 We’ve teamed up with Gray and Here Magazine to send you and your plus one on a dreamy Italian getaway! The Amalfi Coast stole my heart the first time I visited years ago and has beckoned me back many times since.